New study shows Pacific Decadal Oscillation and sea surface temperature drive US tornado strength | Watts Up With That? From the University of Missouri-Columbia, one more example of how natural variation has trumped the supposed forcing of CO2 to make ‘bad weather’. COLUMBIA, Mo. – Meteorologists often use information about warm and cold fronts to determine whether a tornado will occur in a particular area. Now, a University of Missouri researcher has found that the temperature of the Pacific Ocean could help scientists predict the type and location of tornado activity in the U.S.
McCoy and Lupo found that the tornadoes that occurred when surface sea temperatures were above average were usually located to the west and north of tornado alley, an area in the Midwestern part of the U.S. that experiences more tornadoes than any other area. McCoy also found that when sea surface temperatures were cooler, more tornadoes tracked from southern states, like Alabama, into Tennessee, Illinois and Indiana. In the study, McCoy and Lupo examined the relationship between tornadoes and a climate phenomenon called the Pacific Decadal Oscillation (PDO). PDO phases, which were discovered in the mid-1990s, are long-term temperature trends that can last up to 30 years. According to NASA scientists, the current PDO phase has just entered into a “cool” state. In 2011, more than 550 deaths occurred as a result of tornadoes, resulting in more than $28 billion in property damage, according to the U.S. National Oceanic and Atmospheric Administration. McCoy says that with her findings, officials may be able to save lives in the future. The research will be presented at the National Weather Association Conference this fall. ← This is like asking 'could hurricane Hazel strike again' ? Funny, I came across this older article on PDO and AMO and drought today from one of my followers. It is a good article and is from 2004. Seems their statements in 2004 are doing what they mentioned today with the PDO and AMO in their repot. They think the long term trend driven by a 30 year cycle will have value in predicting imminent storms in specific locations in enough time to warn the public? Did I read that right? How can that be true on tornados, CO2 is the leading cause of more Extreme weather according to 97% of scientist. I’ve read Warmunista comments disparaging the PDO as about fish & nothing else. Any advance in real climatology since 1988 must be disparaged, since it all guts the Overlordship of the One True Gas. Notion would be that the risk threshholds in the model can be tinkered on the basis of the PDO temps to reduce error rates. Not sure that it’s at all feasible, but that’s the gist of it. I’m thinking they don’t mean the type and specific location of tornado activity. This, along with information of warm and cold fronts. Well if they don’t know the specific location, how are they going to warn the public? Forecaster: Breaking news! There’s going to be an F5 tornado sometime tomorrow somewhere in the United States. Evacuate now! It appears that during the late Miocene & Pliocene Epochs, the equatorial Pacific experienced a more or less constant super El Niño state, with teleconnection effects in some regions corresponding to those observed now, only more weakly, during El Niños. About three million years ago, North & South America yet again hooked up, blocking previously normal tropical oceanic circulation, possibly driving the Gulf Stream farther north, bringing moister air due to warmer waters, aiding the build up of ice sheets, modulated by the Milankovitch Cycle. I think of monk seal distribution. Before the Isthmus formed, closely-related monk seal species evolved in Hawaii, the Caribbean & Mediterranean Seas. After the Paleo-Panama Strait became an isthmus the Hawaiian species was isolated. The Caribbean went extinct in the 20th century (not officially declared so until 2008), but the other two species are hanging on, but both considered critically endangered. They’re vestiges of a previous ocean circulation pattern. Maybe the PDO connection is a stretch, but makes some sense, IMO. Forecaster: More breaking news! Al Gore called and said this one could be an F6. He’s working on having the scale officially expanded to accommodate the increased threat intensity. It could happen anywhere in the world, anytime in the next 11 centuries! That’s a millennia that goes to 11! We need to evacuate the planet! Since tornadoes are a local phenomenon driven 99+% by local conditions just hours before the actual event, it is not only not feasible, it is completely unreasonable to make such a claim. Depends how often they update their forecasting model really. Ideally, that’s often enough to not matter. But then, while I’ve long thought HL Mencken was a naive optimist; best practices in Climatology have forced me to acknowledge I am also. Tornadoes are local weather events. Predicting trends in frequency and strength over a 30 year period is climatology. It is of zero practical use in predicting a specific tornado in a specific location. This article is not clear at all regarding statements that connect ocean temperatures and tornado activity. Maybe I’m not interpreting or reading it right. Regardless. The correlation is there for more strong to violent tornadoes during global cooling years, which correlate nicely with the -PDO and more La Nina’s. When temperatures are colder at higher latitudes, the greater meridional(horizontal) temperature contrast provides increased energy to storms. 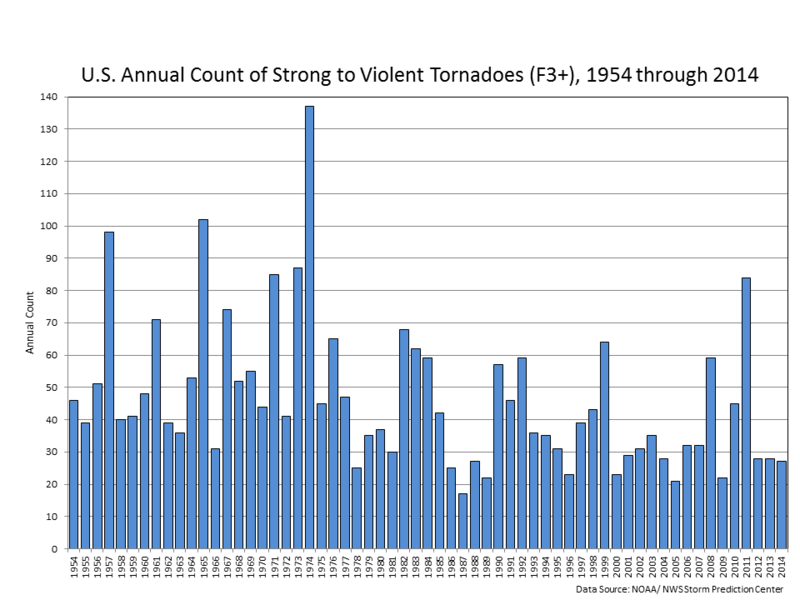 Note the higher incidence of strong to violent tornadoes during the global cooling years of the 50’s-60’s to the mid 70’s. Global warming in the 80’s and 90’s was greater at the higher latitiudes of the Northern Hemisphere(along with melting Arctic ice). This decreased the meridional temp contrast, resulting in less energy and less violent tornadoes. With our ability to detect tornadoes better the last few decades(doppler radar, spotters and expanding population), there has been a slight uptick in weak tornadoes reported from just this, that previously might have been missed. No thanks, I’ll wait for the paper. My guess is that’s what will be reported. Let’s see how the mainstream media handles this. So the warm phase EXACTLY FITS the only global warming we’ve had due to people. I know correlation doesn’t (necessarily) imply causation but…since the theory of CO2 causing warming is based on the firm foundation of “What else could it be?”, which convinced 97% of climate scientists…well new work over the past couple of years has answered the CAGWers question with a firmer foundation. Note also, that the PDO wasn’t discovered until the mid 1990s (when global warming was nearly done). Oh well, with billions in research and a couple of trillion in mitigation and intimidation, I guess you win some and you lose some. 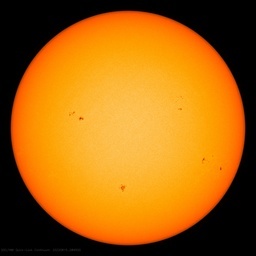 On the bright side, we already have the legislators and activists in place to tackle global cooling. ENSO with sea level pressure in the North Pacific. I still find it hard to believe that the PDO was discovered only 15 years ago by someone studying salmon. IMO, this further weakens the credibility of climatologists who missed the climate impacts of just the LARGEST ocean on our planet. I’m not a scientist but this is fishy to me. What drives ENSO and sea level pressure in the North Pacific? Two different aerological domains… and concomittence is no causation. This PDO, ENSO stuff circa Walker 1924 is the climatology of the 21st century after CAGW is failing. Statistical pressure centers… LOL Not surprising real driving processes are nowhere to be detected with this kind of approach. Go ahead, keep pushing. If I ever buy a reader it’s going to be so I can read that book of yours. So now we have some statistical correlation between US tornado strength, SSTs and the PDO. I may not have the complete list of phenomena there. It could be some mystery 4th parameter also correlates; might even be a fifth one. Now all I need is some evidence as to which one is the cause, and which one is the effect; and which ones just simply don’t relate to the issue, but just correlate. Maybe the cause is that 6th phenomenon that I forgot to mention; which I also seem to have forgotten the name of. Just hurry up and figure it out. Daylight tornadoes are one thing, after dark they are a whole other thing. We’ve known this for some time. The 1974 Super Tuesday tornado outbreak was in a (ta-da!) La Nina year. 2008 too. Tornado Alley….got its name because its the meeting point of warm moist air from the Gulf with cold dry air from Canada. You can massage statistics to ‘prove’ all kinds of stupid stuff. Sure. But then weather forecasters don’t predict the specific doppler values for specific pixels either. It’s a probability model. And that does need rebaselined. But then last I remember were actuaries getting twisted and calling for legislation because their risk models were out of joint. But then these professionals that do nothing but risk models had failed to update them in 30 years also. PDO drives “a lot” of things! I UTTERLY disagee with what this paper says. This is a classic example of someone sitting at a desk and crunching numbers – and not knowing what the heck the numbers even MEAN. Heck, his text doesn’t even agree with his maps. His description of the cool phase of the PDO – compare that to the map – no connection whatsoever. Everyone in the room is now stupider for having listened to him. I award him no points, and may God have mercy on his soul. Take heart a little bit. Yes, biologit Ste3ven Hare was the first to publish the PDO – and name it. Trust me, he was not the first to recognize it – but he beat then Oregon State Climatologist George Taylor to publishing on it. Taylor told me about it all in a personal email, back about 12-13 years ago. He found it and then took too long. That happens sometimes. But George, being the really decent guy he is, was just glad it got out there, that the world knew about it. YES, it is and will always BE the elephant in the room, dominating the Pacific like it does. Because the Pacific is the elephant in the room. 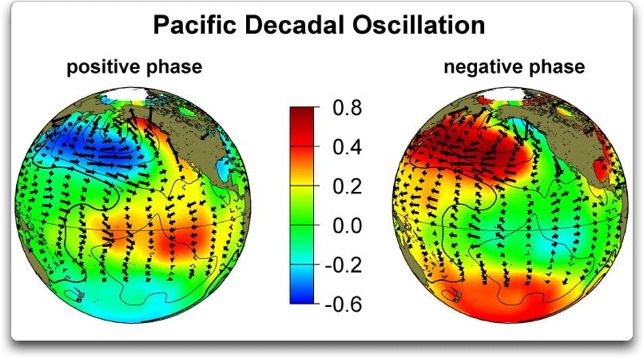 Nothing puny humans can do can match what the Pacific does, and the PDO is its biggest mechanism. At the same time, this paper is garbage. The wrong conclusions have been drawn. If it leaves out the Gulf of Mexico and its über-warm, über-moist air masses as a factor, then it is rubbish. There ARE no tornadoes without the Gulf’s hot, wet air masses. Period. All the energy is in THAT air, not the air coming off the Pacific. Anybody living in any part of the Midwest and watches the weather knows all this. Nevertheless, it’s good for such connections to become more widely known. I can’t wait to share this with my US Senators, Feinstein and Boxer, as well as my Global Warmists friends. Roy, yes I believe I first learned of the US tornado/PDO connection here on WUWT from your post. Steve Garcia: can you point us to your published work refuting this research? Would someone please explain the connection between the sea surface temperatures and the jet stream? I’ll do some homework, but guidance from a knowledgeable person would be a good thing. I couldn’t tell from your comment whether you were using a figure of speech, and the only difference is the amount of light, or whether you were making a substantive (if somewhat obscure) reference. And if so, what were you referring to? So what the author is saying is now that the Meteorologists know the effects of PDO cool and warm phases they can determine the potential of a severe tornado occurring like several hours before it happens. They can do so because they can project the “path” of both the warm front and the jet stream to the “trigger” point where the two converge (overlapping). Plus a dry line from New Mexico. Our biggest storms here in Kansas usually come about when a low tracks out of Southern CA across the 4 corners region, the panhandles and along I-35. I would suspect that the PDO has marked effect on the number and strength of these storms. So what the author is saying is now that the Meteorologists know the effects of PDO cool and warm phases they can determine the potential of a severe tornado occurring like several hours before it happens. As several commenters pointed out upthread, this causal link is not new, it has been known for years. Yet no improvement in forecasting tornadoes has emerged as a consequence. This is something I would GLADLY be shown to be completely and totally wrong about as there would be a lot of benefits in terms of saving human lives. I’m not wrong though, these clowns are regurgitating known science as if it were original, and claiming of it benefits that it doesn’t have in order to justify the grant money that they spent and in order to try and obtain more. Can anybody splain the funky shift in the color scale. The top goes 0, .2, .4, .6 but the bottom goes 0, .2, .6 – This trick seems to be done on quite a few charts that get posted in articles, usually to make the authors point seem more impressive than it is. Here it seems to be … dunno, a mistake? As several commenters pointed out upthread, this causal link is not new, it has been known for years. Yet no improvement in forecasting tornadoes has emerged as a consequence. David, you asked a specific question, …. I attempted to give you a specific answer. Anyway, what you stated above doesn’t surprise me in the least. Rank has its privileges, ya know. Are you familiar with the “wrong headed dinosaur”, ….. Brontosaurus? Chris4692: I do not have a reader, so I purchased the pdf version. I read most of it on my laptop, and and the rest of it on my PC work station at home. Buy the pdf version. You will love it.